I have waited some time for these two books. My husband bought them for me for my birthday and I squealed like a 'tween when I opened the box from Italy. 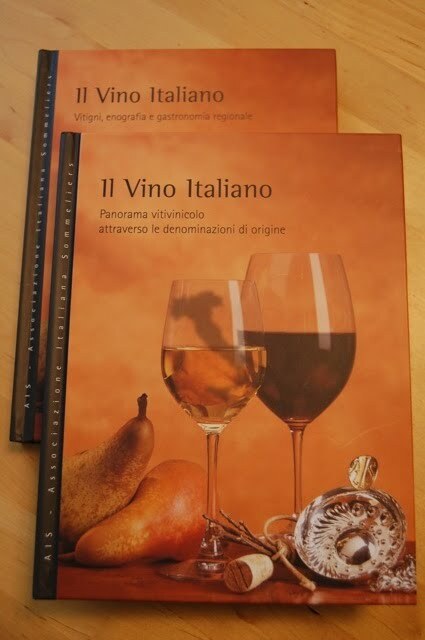 These are the texts that accompany the 2nd level of the AIS (Associazione Italiana Sommelier) certification course. I took the first level in Naples in October and November of 2006, which were to be immediately followed by the 2nd course in December. In true Italian fashion, however, it was delayed. They started it up just as I was going home to Texas for my yearly extended visit in March, so I never got to finish. I made a friend in the class, Lucia, who owned a "prodotti tipici" (local products) shop on the main street in Ischia Porto. She continued on with the course and upon my return, let me borrow the two books for a couple of months. What I discovered was a valuable reference source of all(-ish**) of the DOCGs, DOCs, and IGTs of Italy. Within each region's section was a complete list its appellations with all of the rules governing them (production zone, max yield, varieties, etc) along with a blurb about the wine. This was volume 2B. 2A had a list of all of the common grape varieties, their production zones, synonyms, historical notes and characteristics. I searched for the books in Italy, America, and the great wide Internets. The AIS site did not even have them for sale! Nor did anyone else for that matter. Did I mention that the entire course is in Italiano? Why wouldn't it be? But that's not a problem. I am going to translate it (mostly) for you because I NEED A PROJECT! And it will help me scour the rust off of my Italian. So here starts my series. This is not for the easily bored, nor overly-critical. I just hope to spread the cheer that I experience by having access to this kind of information. **So, calling any list of Italian DOCs and DOCGs "complete" can be a dubious declaration. The fact that different sources site different appellations and new ones come out all of the time lend to the confusion. To save the day, our friend, the Italian Wine Guy, has taken it as his duty to research and publish the most up-to-date and comprehensive list out there. Thanks Alfonso! That being said, the book that I am translating is in its fourth edition and was published this year (2010). Please see IWG's site for the latest news. Thanks, Tracie, looking forward to all the neat posts in the hopper. Go get 'em tiger! Hi Eric, thanks for reading. I do not know of any translated versions, that's why I'm doing this. If you find them, let me know!